It seems like it’s been forever since my last blogpost, but lots of good things have been happening since then. I celebrated my 23rd birthday, my littlest brothers celebrated their birthdays (they’re now 8 and 10 and I told them stories about their baby years, which made me feel really old), I got my first tattoo, and I started reading a new book called Thinking With Your Soul: Spiritual Intelligence and Why It Matters by Dr. Richard Wolman. It’s inspirational and I’m enjoying it so far. So what is home? Where is it? I always called home the town where I grew up, and more specifically the house I grew up in. Now that my parents are moving out of my childhood house next month, it’s bringing up the idea of home for me. Does home change, or does it stay your hometown? What if parents move during college, does your home move with them? What about those people who moved around a lot as children and didn’t have a consistent place to call home? My parents have lived in the same house for over 20 years. Even if their house didn’t feel like home, Utica (not so much Frankfort, the town where they actually live) always gives me a homey feeling. While I was in college, it took a while for my undergrad, or even the town of Geneseo to feel like home. It wasn’t until my senior year when I moved off campus and lived with people that I got along with that it felt like home. It felt temporary because even though I was all about making the most out of my college experience, graduation was going to happen regardless and I’d have to move on. I’ve gone back a couple times and when I have visited that magical college appeal has worn off. It served it’s purpose at the time, and now I have most definitely moved on. A few months after graduation, I moved to the Finger Lakes for an AmeriCorps VISTA position. I’m currently living in Canandaigua, which has been nice. I like living near the lake, I’ve met some great people, and my apartment is nice, but it also doesn’t feel like home. This place, like college, feels temporary since I always thought I’d leave after my AmeriCorps term ended. Similarly to undergrad, at this point I’ve gotten all I can out of it and I’m looking for a change. This time I’m looking for a place that has more going on. The twentysomething home is a strange concept because it seems like it can be forever changing. I have a restless, free spirit, so I can’t imagine settling down anytime soon. This makes home, in reference to a location, a difficult concept for me. During my weekly meditation class last Tuesday, we tried something new. Instead of seated meditation, the instructor asked us to try a walking meditation with the prompt to walk like we feel at home in our bodies. This was my ah-ha moment. That meditation experience really resonated with me because I’ve considered having strong connections with others a state of being home, yet I hadn’t considered the same with connecting with myself. So if home is a place where I feel loved, accepted, and that provides comfort, why shouldn’t it be in the space I create for myself? After all that, where and what is home for everyone else? Good morning, world! It is cold and cloudy on this “Spring” day here in the Finger Lakes. But at least it’s not snowing, yayyyy. Anyway, since this blog is going to be about life as a twentysomething with some spirituality thrown in, I figure it’s probably best to explain what the title of the blog means before going any further. Cool, right!? Is your mind blown? I hope so. This is serious stuff, people. 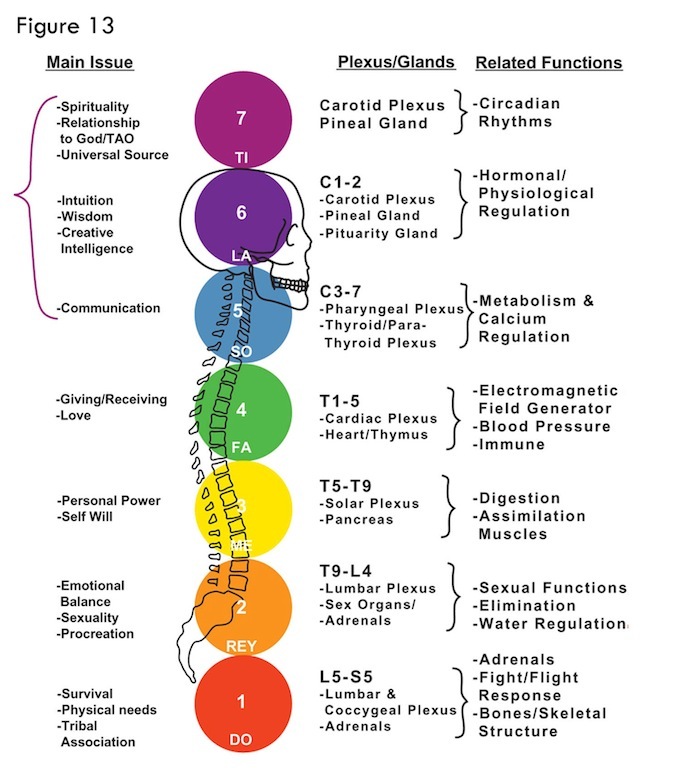 Chakras are related to all sorts of things like auras and crystal healing. The color of your aura is tied to the corresponding chakra color. For example, if someone’s aura is yellow, then that person may be feeling particularly self-confident or optimistic that moment (auras change based on internal and external stimuli, so the colors aren’t necessarily constant). Crystals used for healing purposes work similarly. If I’m having trouble feeling grounded, then that’s a root chakra problem and that chakra is represented by the color red. With that in mind, I would find a crystal that is also red such as garnet, bloodstone, or red jasper to help with ground me. The third eye is associated with intuition (as shown in this chart). Unfortunately, some people ignore their intuition or don’t trust it. I went through a period of not trusting mine and tried rationalizing situations instead, but I found that when I did that my gut feeling was usually right. And that is what inspired the title along with a little help from my friends who brainstormed with me (thanks, guys). As a twentysomething, finding and trusting my intuition seems to be an important adage. So mapping the third eye = further exploring and unconditionally trusting my intuition. If it feels like I’m on the wrong path, then I probably am. Welcome to my blog and thank you for checking out MY VERY FIRST POST! This has been a long time coming, but after I worked through the mess that was (is?) my life as a post-grad, first full-time employee, wtf-is-my-life transition, I’m finally checking blogging off the list. Yay for progress! Speaking about working through the mess, this whole twentysomething phase makes life so complicated because it’s nothing but transitions. I’m not sure if anyone else remembers that Britney Spears song “I’m Not a Girl, Not Yet a Woman” (watch here), but when it was first released I was 9. I had no idea what it meant because I saw growing up as being a very black and white occurrence rather than a life-long process with lots of gray areas. Sometimes I think about that song and how it could be the anthem for anyone trying to figure it out. But then again, it’s Britney Spears. Twentysomethings nowadays seem to have this rough, drawn-out transition phase more so than ever before. People are educating themselves and getting more degrees. They are waiting longer to get married, settle down, and perhaps have a family. They’re using this time between degrees to travel and experience all that the world has to offer. This combination makes our generation much more focused on reaching their full potential, and to do that we must take the longer route to get there, to dig deeper and discover the true self. Maybe this is only true for my like-minded, self-actualizing friends, but regardless, I find this shift in ideals fascinating. One way I have been working through this transition is through meditation. Meditation is interesting because it can mean a lot of things depending on the individual. I’ve learned different approaches to meditation such as zazen (sitting in silence counting breaths), and more of a Kundalini meditation approach, which is focuses on the flow of energy within the body. Some people don’t get anything out of sitting in silence and that’s fine, but that’s also the beautiful thing about meditation. To other people meditation means finding that oneness with the world by playing in the dirt (otherwise known as gardening), or it can be through hobbies like running, drawing, or playing music. Doing these meditative activities that we enjoy is really powerful because as long as we find enjoyment in it, it helps us find ourselves and can be treated as a learning experience. We attract the energy we give off, so by seeking out inner peace and self love through meditation (however you choose to define it), we will get that in return. So fellow twentysomethings, what are your thoughts on navigating this transition? How can we find peace in this period in our lives? What are some ways that you meditate or some hobbies that are meditative to you? I’d love to hear feedback in the comments!